“The song is an original arrangement of a gospel spiritual called ‘Samson and Delilah,’ composed by the Rev. Gary Davis. The track is performed by Shirley Manson and arranged and produced by Bear McCreary … specifically … to fit the episode’s opening sequence.” For those who don’t realize, Bear McCreary is the composer for Battlestar Galactica, and has been the genius behind everything from that show’s opening credits to the adaptation of “All Along the Watchtower” used in the Season 3 finale. So I’m thrilled to hear that he’ll be scoring this show. During the opening scene, we learn that Cameron wasn’t so much blown up as cut up a bit by the car explosion at the end of the finale. Should her skin or at least her hair have been burned off by the flames? Probably. Let’s just say I’m choosing to let detail that go for now. Maybe her skin and hair are only human-based, and are tougher than we realize? Who knows. It’s not important. Because the scene works — an injured Cameron loping into the house, presumably to save the Connors from Sarkissian and his goon, inadvertently starting a fire along the way (as Shirley sings about burning the building down), finding John … then targeting him for termination. 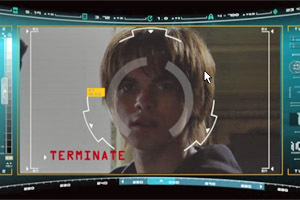 The rest of the episode centers around the reversal of an electronically damaged Cameron hunting down the Connors, rather than protecting them. Cutting to the chase, they eventually incapacitate her, and they (Sarah and John and Derek) decide to destroy her. But John isn’t happy about this. In part, because just before he shut her down, Cameron professed her love for him. And while he must realize that this was just a desperate act of deception, it clearly gets under his skin. He’s torn by the feelings he has, and by the fact that he knows his future self created Cameron, and isn’t sure how much to trust that. In the end, he countermands the group, and after cleaning her chip off, decides to boot Cameron up again, then hands her a gun to prove that she isn’t the enemy any more. Problem solved … for now. What’s interesting is that with this episode, the power clearly seems to have shifted from Sarah to John. When he decides to bring Cameron back into the fold, the group accepts it. And our last image of Sarah in this episode is her sitting passively outside a closed door, John on the other side cutting his hair (like Samson), redefining himself, taking control of his destiny. And only at that point are we reminded that it’s still his 16th birthday. From this point on, he is not a child, but a man on the way to becoming a leader of men. And Sarah seems to realize that she will need to adjust to that. Meanwhile, a new player has been introduced to the mix — Catherine Weaver (played by Shirley Manson), CEO of ZeiraCorp, who has recently acquired the Turk for $300K. She’s a creepy one, Catherine Weaver, with all sorts of wacky theories about the machine-like nature of humans and the human-like nature of machines. She holds an executive meeting, and announces that she’ll be cannibalizing each of their departments for a new cross-discipline division at ZeiraCorp called “Babylon” (it’s from the Bible) that will “change the world.” The head of the A.I. division balks at this, and while taking a leak, is attacked by a morphing urinal. Which isn’t really a urinal. It’s Catherine Weaver. Who is a terminator. Dude!!! FOX is calling her a T-1001 model. For reference, Arnold was a T-800, Cromartie is a T-888, and the liquid metal terminator played by Robert Patrick in the T2 movie was a T-1000. So presumably, Catherine is one model better than him. I guess it remains to be seen what the difference is. It may only be the one extra USB port (think about it). Regardless, I’m guessing that her mission in this timeline is not to kill John Connor, but to make sure that Skynet is actually born. A goal that is, of course, in direct conflict with the Connors. So I think we can expect some fireworks before this season is over. One extra USB port, HAHAHAHA. Good one. I’m SO excited she’s a Terminator and a liquid one at that. So much untapped potential there. Do we think Cameron and Catherine actually have some ability for feelings? Catherine said to that guy, “The feeling’s mutual.” Terminators aren’t supposed to have opinions on anything much less hate. I’ve heard grief from a few people already about the fact that she’s a liquid Terminator. Jill, I’m with you in that I think it creates a lot of potential, but others seem to think it pushes the story too far along — that once you have a liquid cyborg, particularly one that’s in a position of corporate power, the chips are stacked too high against the Connors. But I have confidence in the writers at this point that they’ll keep the balance. Good question about Cameron and Catherine. The writers certainly do seem to be building a picture of them that implies emotions. But I can’t figure out yet whether those feelings are true or only emulated. Assuming that part of a covert terminator’s ongoing training is to watch TV and movies in order to fit in, it wouldn’t be hard for them to pick up the habit of saying things that sound “human” even if they aren’t. Like a parrot does.